At long last, I stopped working long enough to go for a half decent hike. I had the perfect reason to do so. Five of my grandkids came to visit last week and they were ready for action. We went swimming and boating at a local quarry. We went fishing. 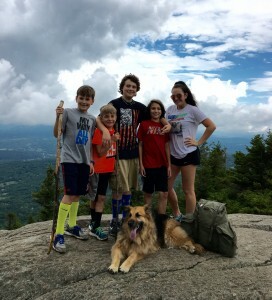 And when the opportunity arose, we hiked up Stowe Pinnacle for a great view of the valley. My dog Matika went with us, of course. Grandma Judy stayed in the trailhead parking lot and knitted. She’s not a big one for bagging peaks. I fashioned a hiking stick for Johnny, who stayed close to me during the hike, asking all sorts of questions about the natural world. The others charged ahead. The eldest boy, Hunter, stopped the gang every once in a while, making sure to keep Grandpa in sight the entire time. I was carrying a rucksack full of water bottles, rain jackets and other accoutrements. That’s my excuse for bringing up the rear. Fact is, all the kids play sports and are in good shape. And Grandpa, well, he’s not as strong a hiker as he used to be. We started early in the morning. T-storms had been forecast for that afternoon. Tight window. I wanted to get everyone up and down the mountain before the rain came. The forest was still wet and humid from rain the day before. I kept warning my young hikers about the dangers of a wet trail, but they seemed more interested in the red efts underfoot. On top I gathered them all for an obligatory snapshot. Then we drank water and ate snacks while enjoying the view. We didn’t linger. A squall crossed the valley just to the south of us. I thought it best to get off the mountain right away. We felt a few raindrops on the way down but the predicted storm didn’t arrive until we were eating lunch back at the cabin a couple hours later. Nearly everyone slipped and fell once. No one was any worse for it though. Kids are resilient. I was exhausted from the hike yet happy to have done it with them. One doesn’t get a chance to create memories like that every day. Next year we’ll do Camel’s Hump. 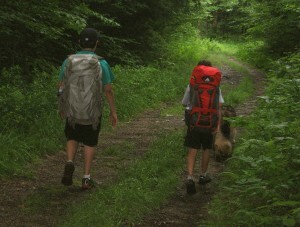 This week I took two of my grandsons, Hunter and Mason, backpacking for the very first time. I’ve been meaning to do it for years. They live in southern New Hampshire, nearly 200 miles away, so I dreaded all the driving. But sometimes, in order to make something truly worthwhile happen, the driving has to be done. I took my dog Matika with me, of course. Wouldn’t dream of going in the woods without her. I picked up the boys and took them to Pilsbury State Park where we hiked to a remote campsite. I parked the car in the main campground, just shy of the gate. Beyond the gate we had the woods all to ourselves. We had a sweet campsite on North Pond, which has occupied only by ducks, geese, and other wildlife. The boys found wood frogs in an ephemeral pool and red efts along the trail. At dusk a barred owl called out. They thought that was pretty cool. We were busy for three days. We did a lot of hiking and fishing. I taught them how to build a fire, purify drinking water, and sling a food bag in the trees to keep it away from bears. I taught them simple things, like how to stay relatively dry despite the rain. They knew nothing about how to be in the woods. Was I ever that much of a tenderfoot? I must have been, when I was their age. Their favorite part of the outing, they told me later, was our short hike up to Balanced Rock. I’m not quite sure why. Maybe they liked negotiating such a twisty, narrow path. Maybe they liked the effort it took. Or maybe the reason is a lot harder to articulate. The wild worked its magic on us during the walk – that much is certain. That’s something I have come to expect. But it was new to them. While driving back to Vermont by myself, I marveled at how quickly the outing went. Such a whirlwind of activity! By the time I caught my breath it was over. Some powerful memories were created in young minds, no doubt. Next month, Judy and I will take all six of our grandkids camping. I can only imagine how intense that’s going to be. Every summer Judy and I have all six of our grandkids for four or five days. No parents allowed. We play, go fishing and swimming, do crafts, camp in the back yard, watch movies, and eat all the wrong food. It’s a lot of work, but there’s no better way to get to know them. Now that the youngest ones are able to hike, we’ve started taking the kids into the woods. Now it feels like they’re getting to know me. The forest is my element. Walking with them in the tracks of wild animals, teaching them how to navigate trails while pointing out the wonders along the way, well, it doesn’t get any better than that. Not for me, anyhow. 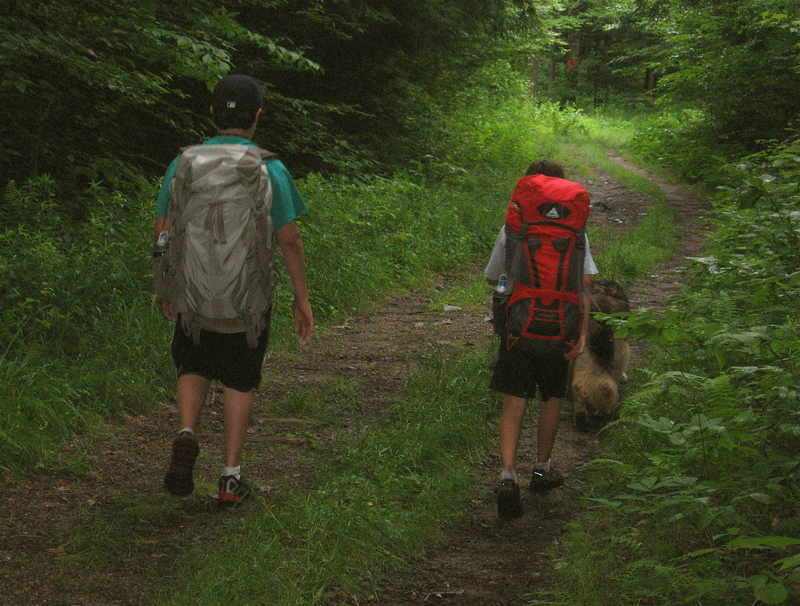 This year we went for a short hike along the Long Trail – my old stomping ground. We split into two groups. The more restless ones speed-hiked with me to Prospect Rock, while Judy meandered along the trail with the rest. Judy’s group grooved on mushrooms and everything else they found along the way. My group enjoyed physical exertion and a good view from the ledge. We got back together for a picnic lunch beneath the footbridge spanning the Lamoille River. 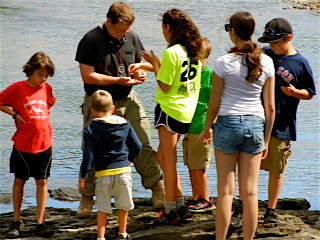 There the kids found crayfish and some interesting rocks. Yes, rocks: quartz, mica and the rest. Even in the digital age, kids find rocks fascinating. After lunch, while finishing the hike at a much slower pace, we checked out a cave, collected hardened sap from a wounded tree, and gathered more rocks. Jewelweed growing in wet places caught their attention so I showed them how to capture the tiny, almond-like seeds that shoot out of their pods when they’re touched. It was a lot of fun. They were surprised by how good the seeds tasted. Then I showed them how to use the plant’s juices as a salve for mosquito bites and other itchy skin. They were impressed by that. And I couldn’t have been happier. Each year my wife Judy and I have all the grandkids over to our house for several days without their parents. We call it summer camp. It’s an opportunity for us to bond with each other while having lots of fun playing games in the back yard, fishing, swimming, and generally goofing around. 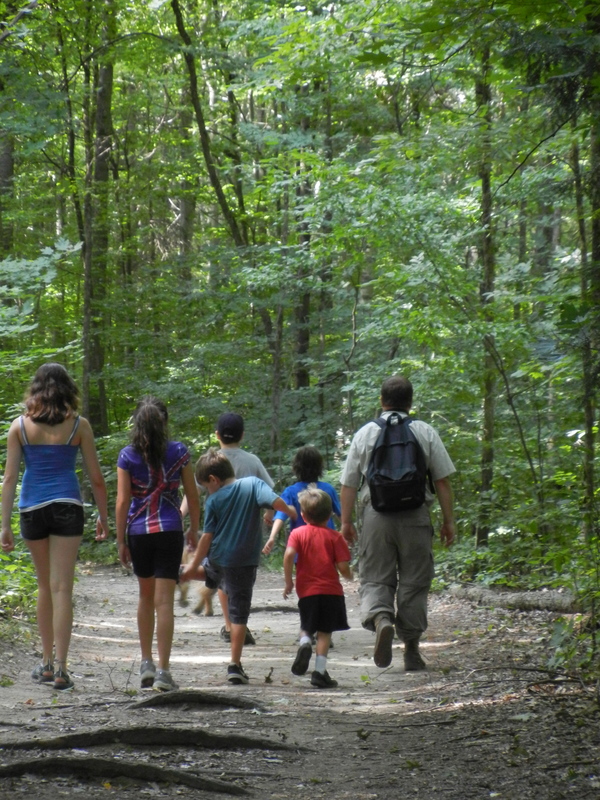 Towards the end of summer camp this year, we all went for a hike at Niquette Bay State Park. It was something just a little different. It was a hot, humid day. I brought three liters of water for us to drink. We could have used more. My dog Matika drank from the tiny streams that we crossed. She got the best workout, running back and forth between the fastest and slowest hikers, trying to keep everyone together. German shepherds are like that. They don’t like having the pack dispersed. Everyone enjoyed the walk, yet no one enjoyed it as much as I did. Judy and I haven’t spent enough time in the woods with the kids – Kaylee being the exception. Since the woods are my element, I’m hoping that this will change in the future. But the pack is widely dispersed between Vermont, New Hampshire and Virginia most of the year. Matika has her work cut out for her. It’s amazing how fast the kids are growing up, how easily the days slip away. Judy and I make a real effort to stay in touch but our work-a-day lives distract us. We’ve talked about taking all the kids camping sometime. During this last visit, Kaylee mentioned that she’s only three years away from going to college. Clearly we had better plan something soon. 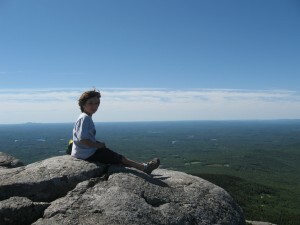 Yesterday I finally made good on a promise to take my grandson Mason up Monadnock. 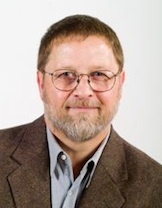 He had been bugging me about it for years, ever since his family had moved to a new home in New Hampshire only fifteen minutes away from that mountain. I told him we’d do it when he was eight, thinking he’d have to be at least that old to have the stamina necessary to make it to the top. Well, he turned eight a week and a half ago, so off we went. While studying the map a few days before the hike, I began to worry. With 1800 feet elevation change over two miles, I wasn’t sure the little guy could do it. More to the point, I didn’t want the hike to be so grueling that it turned him off hiking forever. As we were getting ready I told him that we didn’t have to go all the way to the top. In so many words, he told me that failure wasn’t an option. We got an early start, walking in the cool morning air. I set a steady pace as the trail gradually climbed. I checked with Mason regularly to make sure he was doing okay. His face was expressionless. He sat down every time I stopped to catch my breath. I warned him that it was going to get steep ahead. He said nothing. But when we reached the first pitch he sprung to life. He dropped his walking stick and scrambled up and over the rocks on all fours. He moved just like Spiderman, as he explained to me later. “Wait up!” I shouted after him, then I started climbing a bit faster. As the trail grew steeper and rockier, Mason became more animated. “Come on, Gramps!” he yelled then he stopped and waited for me to catch my breath. I started laughing. Oh sure, he’d get up the mountain, all right. But would I? Mason was surefooted and being careful. Still I didn’t want to take any chances. I kept him close to me when we broke above the tree line. I pointed out the cairns, explaining how these rock piles were necessary to find one’s way across the barren rock whenever the mountain was wrapped in clouds. Ours was a calm, blue-sky day, but Mason suddenly leaned forward as if struggling against a strong wind. “Keep going, Grandpa. We have to make it to the top,” he said. I assured him that we were almost there. Upon reaching the summit, Mason found a rocky promontory for us to sit and enjoy the view. We drank plenty of water and ate snacks as a cool breeze dried our sweaty shirts. We shared the summit with half a dozen other hikers. During the long descent back to the parking lot, we passed 59 other hikers on their way up. Mason kept count. We were both glad to be finishing our hike as the temperature reached 80 degrees. We hopped in the car and went to Jaffrey for lunch. “So what are we going to do for my ninth birthday?” Mason asked. I just smiled, being careful not to overcommit. Then I told him that I’d think of something. A few weeks ago, when Mason turned five, I promised my grandson that I would take him hiking and fishing for a day. Just the two of us – no brother or sister along. Incessant rain and my busy work schedule made it difficult to make good on the promise right away, though. When finally a rain-free day appeared on my weather website, I called Mason’s mom to arrange an outing. I picked up Mason right after breakfast and we headed for the nearest body of water. We caught a few sunfish at Arrowhead Lake, but it wasn’t the kind of rock-and-roll action I’d been hoping for so we drove over to the Lamoille River. Didn’t do any better there. Surprisingly, Mason didn’t complain. When I suggested that we go for a hike next, he was all for it. We went to Niquette Bay State Park and hiked down the broad, flat path towards the beach. Mason shouldered a teardrop pack loaded with all kinds of stuff, keeping the park map firmly in hand. I carried along a fishing rod, just in case. While standing on the shores of Lake Champlain, we saw the forested point where the park attendant told us to fish. We headed for the point, walking the beach until it disappeared into reeds. The lake is high this year, due to heavy rains. No matter. Mason charged up a goat path heading straight uphill. I warned him that it looked like a tough climb but he didn’t care. He was ready for the adventure so up we went, huffing and puffing, our feet slipping in sandy, loose soil all the way. At last reaching the Beach Bypass Trail on top, we took a break. We drank water and ate trail mix and talked about stuff until we were ready to go again. I said we could take the easy path back to the car if he was tired, but Mason wanted to keep going to the point. Okay then. Beyond a deep ravine, the path narrowed as it wound up and down through woods and rocks until we reached the point. There a broad, flat rock dropped into deep water and, sure enough, we got into a few more fish. But it was nothing to brag about. We were distracted once by a frog leaping across the rock and again by a gaggle of teenage girls nearby who started jumping into the water. Mason wanted to do the same, but I reminded him that we didn’t have bathing suits with us – truly an oversight on such a warm, sunny day. While hiking out, Mason and I took turns spotting chipmunks and red squirrels half hidden in the surrounding forest. “Good eye!” I told him. Then we talked about coming back here with his mom and brother and sister someday. I took a deep breath, then exhaled, saying how much I love the smell of the woods. Mason did the same. Then I mentioned how lucky we were, with all the rain lately, to have such good weather to hike. “Yeah,” Mason said, “It’s a perfect day!” I smiled at that, all the while thinking how the day could have been better. Then I agreed. Although Kaylee had camped in the woods in years past, she had never climbed a major mountain or backpacked any significant distance. A few days ago, we changed that. With walking stick in hand and an adult pack tugging at her shoulders, my 11-year-old granddaughter followed me and my dog up the Emily Proctor Trail, deep into the Breadloaf Wilderness. While the trail ran flat in places, it was a steady uphill climb for the most part – three and a half miles to the Emily Proctor Shelter. Halfway up the trail, we forded the headwaters of the New Haven River. Usually an ankle-deep stream, it was a torrent thanks to all the rain that had fallen in previous weeks. We crossed barefoot to keep our footwear dry. Kaylee’s pants were wet to mid-thigh by the time we reached the other side. About a mile shy of the shelter, the wet, muddy trail steepened considerably. I started huffing and puffing; Kaylee bore it all stoically even though her sneakers were soaked. “The shelter can’t be that far ahead,” I kept saying, but secretly I feared that we’d taken on too much of a hike and my young woodswoman’s spirit would be broken by it. The two fiftyish women hanging out at the Emily Proctor Shelter were surprised when Kaylee popped into the clearing with girlish buoyancy. They had hiked up the trail earlier so they knew how hard it was. Kaylee and I chatted with them briefly, then found a tent platform not too far away where we set up camp for the night. I cooked dinner on my stove. Kaylee wanted a campfire but I pointed out that the surrounding woods were so wet that it would be more trouble than it was worth. Kaylee noticed how fast the clouds were moving overhead. I explained how they gain speed as they cross over the mountains and how quickly the weather can change as a consequence. She soon found out for herself. When she left the tent to pee around midnight, the sky was full of stars – more than she’d ever seen before. Her second time out, she was in a dense, boreal fog. At daybreak the sky was partly blue, then dark clouds appeared out of nowhere and it drizzled. Ours was an easy ascent to the summit of Mt. Wilson only a few hundred feet higher than our camp. We perched at the lookout around mid-morning. There we watched some clouds roll over the ridge then drop into the valley below. “Amazing,” was all Kaylee could say. That’s when I knew that the difficult climb the day before had not been in vain. I patched Kaylee’s blisters as we descended the Emily Proctor Trail and tried to lighten her pack when it started digging into her shoulders. I made a mental note to get her real hike boots and other appropriate gear in the near future. It was now clear to me that she was into backpacking. After recrossing the stream, we fished for trout without success. That, fatigue, and the threat of rain made us change our plans. We had intended to camp a second night along the river, but hiking out and having dinner at Friendly’s suddenly seemed like a better idea. The flash floods that struck the area the next day assured me that we had made the wiser choice. “You’re lucky,” the two women at the shelter had said to me. I had agreed. You can’t beat the company of an open-eyed child on the trail. The sense of wonder that one feels in the wild erodes over time, but the fire burning strong in young hearts can rekindle it. I only hope that my creaky, old knees hold up as I backpack with Kaylee in the years ahead. After all, she is just beginning to explore the world and I want to be there for as much of it as possible.